I must say it’s a LOT simpler than it used to be when I worked at Microsoft. Okay there are still some hoops that you have to jump through, but overall, it’s not that difficult to do, and to get a “good” working cluster up in 2-3 hours or work, from scratch! Below is a list of the steps that I took when installing a 2 node Active / Active (yes I know that’s bad!) 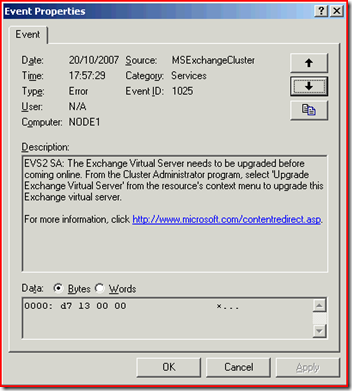 cluster for Windows 2003 SP 2, and Exchange 2003 SP 2. Installing Windows is as normal except that you should press F6 lots of times when the installation starts, so that you can specify the .flp file downloaded from the above link. In order for this to work you add the virtual floppy drive to the server, but do not connect it until you get to the blue screen where you are asked about additional drivers. After the first reboot, don’t be worry if you get an error about not being able to find NTLDR… just disconnect the floppy drive, and restart! The rest of the Windows installation is as normal, just carry on accepting all the defaults, and setting the language options. I normally create a cluster administrator account, and then either make the account a member of the local administrators group on each node in the cluster, or more normally I just add the cluster administrator account to the domain admins group for the domain. Firstly you should format the disks as Basic NTFS and assign drive letters. I always like assigning Q to the Quorum disk. This time when you run Cluster Administrator, you opt to join an existing cluster. All you need then is the name of the cluster, and the cluster administrator password. From Cluster Administrator you literally pick the group you want to failover, and then right click, and choose Move Group. It can take 30-60 seconds for the resources to fully move over to the other node, on my environment the “slow” resource appears to be the Network Name resource in each group – I’ve not looked in to why that might be. I do this on the inactive node, and then restart it. Before installing Exchange I made sure that the cluster administrator was delegated an Exchange Full Administrator role. I just think that will save any problems in the future (I’m not sure it is necessary). When installing Exchange on each node, the first process is to just lay down the binaries, in other words run Setup.exe, and follow the installation through. This doesn’t create ANYTHING, just all the registrations, and file copying necessary. You do that on each node, before going on to the next step. There isn’t really a lot that you have to do for this. I always make sure that my cluster group has a nice name, so I can recognise it from the general cluster group. Next you add in to that group a disk resource, an IP address and a network name. The IP and network name are going to end up being the names and IP addresses that Outlook users and Exchange will use, so ensure it meets some sort of naming standings. Once those resources are present, and online, you create a System Attendant resource and make sure it is dependent on the disk and network name resources. You are then ready to online the resource, which might take a minute or two the first time you try it. Installing the Exchange Service pack is good as well. When you try to run the update.exe, and you get to the component selection screen, you can’t continue if the current node owns any Exchange Virtual Servers. You get a nice warning saying that you must perform a failover of those groups (it doesn’t tell you which groups they are though). After the installation of the binaries there is the obligatory restart required. So nothing is/was corrupted (as I first thought). A simple right click in Cluster Administrator, and you can chose the option to Upgrade the Virtual Server. Around 15 seconds later you get a confirmation pop-up saying it was successful. 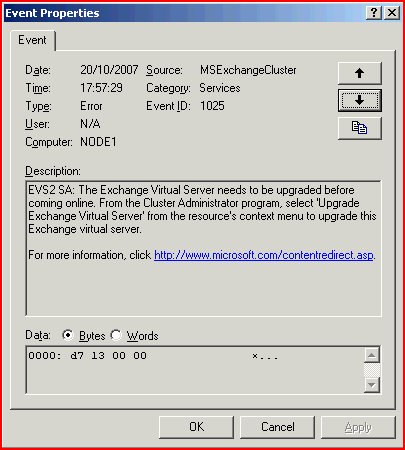 You have to do the upgrade on each Exchange Virtual server on the cluster. Once you’ve down the binary upgrade on one node, you can then do these steps to upgrade the virtual servers and move them to that node, followed by an upgrade of the binaries on the other nodes in the cluster.